One night in college, we were having a Mexican fiesta at our house. I was always looking for new things to try out in the kitchen and I wanted to do something new with cilantro. 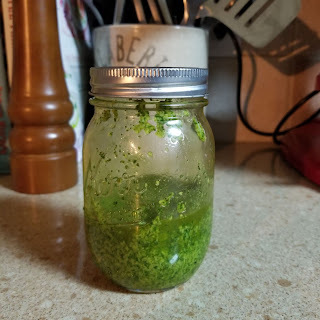 Walking through the grocery store, I had this idea to make a cilantro pesto. I grabbed a few ingredients and was off to the kitchen. Roast the Poblano pepper under the broiler under lightly charred on each side. I like to put the pepper in a storage bag in the freezer to cool it faster. The freezer helps loosen the skin from the pepper faster. Roast the garlic at 350 until lightly browned. A ramekin works well for this. Remove the skin from the garlic after it cools. Combine all of the ingredients in a food processor and blend until smooth. Usually 2 or 3 minutes, depending on how smooth you want it. I made this to go with some chicken tacos tonight!